When I was there, the Minions co-branding was already finished. Price - Hot & Herbs 2pc - $10.30HKD = $1.33USD. 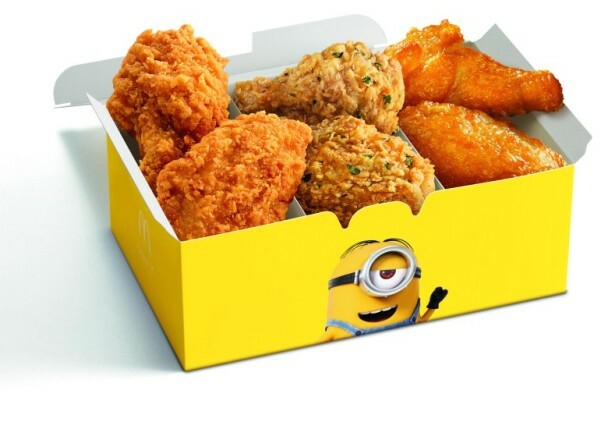 Honey Lemon McWings 2pc - $11.80HKD = $1.52USD. A couple days ago, The Wife and I were transiting through Hong Kong to catch a flight to Boston where we would spend a few days in Rhode Island visiting family. The "promo" burger at the time was a discounted Big Mac and the re-launch Mega Mac, which is just a Double Big Mac, nothing more. They also had a Pineapple Pie, which I've reviewed before and pops up every couple months somewhere in Asia. Since I wasn't going to try any of those I was debating between trying one the side menu promo items. They had a few Fizzy Drinks, like a Green Apple or Peach Tea Frappe, strangely a Caramel Sundae, which must not be on the regular Menu in Hong Kong, but hidden away they also had 2 special McWing flavours, Honey Lemon and Hot & Herbs McWings. I felt these were the best option, so I ordered 2pc of each to give a try. Our flight into Hong Kong was delayed 30 minutes, so our 2 hour connection was cut down to 90 minutes. For anyone else transiting HKG, the queue is always long and snaking, but it moves very quickly. I've had enough time to get a meal on a 45 minute connection but if you can, buy before you arrive at the airport, as inside they charge about a 20% premium on the regular price. It's still the most affordable food option in the airport by far, but I feel it's worth noting. When I was placing my order, my phone notified me saying our flight to Boston had a 1 hour delay, so that meant I could bring the McWings to the Cathay Pacific business class lounge to get a few better photos of the wings (the food court where the McDonald's was crazy busy), unfortunately that turned out to be the wrong idea. Where we ate them. A bit nicer than the food court. That means I could only really try the Honey Lemon flavour. I let The Wife try the first bite without telling her what flavour it was, she could immediately call out the lemon, and she even said it was sweet, but couldn't place the honey. On my first bite it was clear that lemon was the primary flavour, and it wasn't just in the outer skin either, but the entire piece of meat was clearly seasoned. The honey must have been the glaze since even though it wasn't breaded, the outer skin was sticky. Size wise, they weren't that big at all, but they were considerably larger and even with the airport pricing, cheaper, than the Honey Lemon Drumlets I had in Singapore. They were cooked fresh, and I eat them within a couple minutes of ordering, but I found them much oilier than the Pickled Chilli McWings I had from Hong Kong a couple years ago as well. All in, I found them pretty good, but I wouldn't want to eat more than 2pc. They served them up to 6pc boxes, which I likely would have been sick of after the 3rd or 4th piece.